The Japanese invasion on Malaya after midnight of 8 December 1941 under the order of Lt Gen Tomoyuki Yamashita was considered the first day of Japanese Occupation. Japan surrendered to the Allied Powers at noon on 15 August 1945. Malaya and Singapore returned to British colonial rule on 12 September 1945 with the formal surrender by the commander of Japanese forces in South East Asia, when Gen Seishiro Itagaki surrender to Lt. Louis Mountbatten at Singapore City Hall. A 4 cents postcard was issued on 29 April 1943. 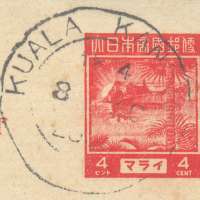 The indicia was the same design as the 4 cents stamp, the wording is also in red. Most of the cards are on quite flimsy light-weight card, which is watermarked Government Printing Works Singapore. The watermark extends across several cards, so a card may have part of it or a straight line or no visible watermark. The watermark tells us where the card came from, and probably where the postcards were printed. A vast number of these cards were printed and used postally. 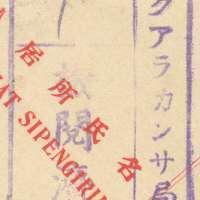 They were cheap, available and postal censorship by the Japanese was tough and continued throughout the occupation. 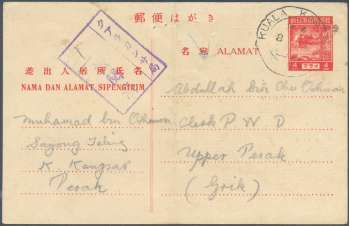 It was franked with KUALA KANGSAR in a circle and interior text on 3 lines, that can safely be deduced that it was processed on 30 August 19xx? The postcard size is 141 x 92 mm. 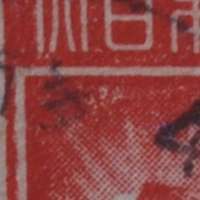 Vertical crease is visible on the front. Four pin holes, middle-top with two holes are very clear. The text was written with pencil. The addressed were written with pencil as well. On the reverse, top-right, evidently was rubber-erased. Jawi script is a writing system that borrowed Arabic alphabet and adding a few more to complement the Malay sounds that don't exist in Arabic language. It is written from right to left. The pronunciation of the script is the same as if it is written in Roman script. It is an alternate writing system in Malaysia, but it was very common among the people of Malaya as it is the only writing system taught at the school and Roman script only taught at English-based schools in big towns. It was a dominant script for the royal, official and reading materials. It was later when Malaya gained independence, the Roman script took superior place and only accustomed to religious and official matters. The postcard was sent by Muhamad to his elder brother Abdullah. [RUBBER ERASED]…… dengan beroleh selamat dan kesejahteraan-Nya. cirit pula lagi yang ayahanda dan bonda sentiasa datang ke atas …. 1. Assumption: the writer went to English school as Roman script writing were limitedly used and taught. Only privilege few of Malays have the chance, OR it was two different person who wrote the addresses and the text on the back. 2. The writer might still survive? Or else try to find the surviving family. 3. Japanese characters and translations were provided by tonymacg, which I am very grateful. 4. 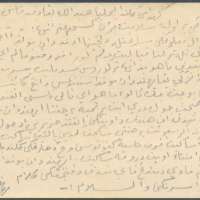 The Jawi transcribing were the work of Halim and some part were of Zuraidah Zandar and Abdul Rahim Jusoh. 6. Process for transliteration will started and updated very soon.